Blogging is an important way to grow your brand, email list and sales, but is it worth the time and effort? I have been blogging weekly for over 18 months, but earlier this year, I decided to blog only bi-monthly. In this blog post, I’m sharing how my Pinterest and search traffic was affected. When I started this blog in 2017, I committed to blogging weekly. 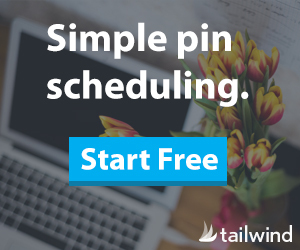 I wasn’t new to providing Pinterest marketing services, but I had a brand new website that needed viewers. Blogging was the sure fire way of getting more eyes on my content to grow my business and establish know, like, and trust. After I began blogging, I saw a huge leap in traffic to my website from Pinterest. The search (Google) traffic came a bit later, but has grown so much from my blog writing efforts. Blogging is valuable for any time of business! It’s your home base and most search traffic (unless you are internet giant like Amazon) is going to lead to a blog post! After 18 months, my consulting business had grown and writing every week had become such a habit for me! I set out an hour or so each week to write the blog post, create graphics, and share on Pinterest. I was addicted because I had seen real growth in my email list (over 2000+ people have subbed in! ), was getting consistent client inquiries, and making sales on my Pin Progress course. But, as your friendly Pinterest Strategist who preaches that Pinterest can bring in consistent traffic from old evergreen posts (posts that are not seasonally specific), I set out to discover if blogging every other week would hurt my traffic. I personally test Pinterest strategies all the time on my own account so I can pass those tips along to my students and clients. Comparing Q1 of 2019 to Q4 of 2018, which are both high activity times for Pinterest, you can see that my traffic actually increased by nearly 9.54% from blogging less. What about my total traffic? Did it suffer? Nope! It actually increased quite a bit during that period overall by 32%! Why did my blog traffic grow while blogging less? Now, you may be asking, “Does that mean that I shouldn’t blog or should blog less frequently?” No! I would encourage you to blog weekly until the point that your traffic is established and you start to see consistent traffic to at least 10 posts. I want you to blog until blogging feels like a joy and not a chore. I had to literally peel myself away from my writing habit to conduct this test. I love blogging because it has changed my business! One thing that I recommend to my clients and Pin Progress students, is to create new pin images to top performing blog posts. In fact, it’s recommended by Pinterest headquarters! Why? Creating new pin images is considered a fresh pin or content on the platform, and the platform will favor fresh content for distribution. Another tip is to update your posts if the information is outdated! If readers ‘bounce’ away from your blog posts because it’s no longer relevant, that will hurt your ranking on both Pinterest and search engines. I’m going to continue to blog bi-monthly and I’ll report back in after 6 months! Are you interested in learning more about using Pinterest to drive traffic to your site? Are you new to Pinterest and want more tips to get started? See my introductory post Getting Started on Pinterest and don’t forget to sign up for my email newsletter below. You’ll receive my FREE Pinterest Start-up Guide for your creative small business where I give easy actionable steps to getting started on Pinterest! Ready to take action TODAY? Enroll in my Pin Progress course!